We are proud to announce our most recent and ambitious project to date. 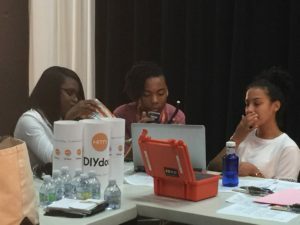 Partnering with HITN and the Kings County District Attorney’s Office Bureau of Youth Initiatives, we have worked together to launch a digital storytelling workshop series utilizing DIYdoc. HITN and DIYdoc are proud to have partnered with the Kings County District Attorney’s Office Bureau of Youth Initiatives, whose work focuses in large part on the prevention of juvenile crime by providing intelligent counsel and programs that open lines of communication between young people, law enforcement and educators for Brooklyn’s at risk youth. Working together, we have launched a cutting edge digital storytelling initiative utilizes the DIYdoc smartphone app to enable young people to produce professional quality videos on their phones, share them with their peers and community on social networks and to create a platform for positive, responsible engagement between our youth and the prosecutor’s office. We are excited that the Brooklyn Bureau of Youth Initiatives has joined us in our vision to help young people and educators use technology innovation and social media for real world impact and positive change. The pilot program, a Digital Storytelling Workshop, for Brooklyn youth focuses on the cycle of online cyberbullying and retaliation that all too often escalates to delinquency and arrests, including cyber-banging, sexting, gun violence, suicide and other troubling online trends that adversely affect at-risk youth in marginalized communities in Brooklyn and across the country. While most of us view cyberbullying from a personal perspective, the Kings County District Attorney’s Office Bureau of Youth Initiatives is tackling this challenge in a visionary way by enabling young people in the community to share their solutions to this challenge directly with the prosecutor’s office. DIYdoc and the Hispanic Information and Telecommunications Network, Inc. (HITN) are providing youth and schools with an easy to use app based platform and digital templates that will let young people share stories on how issues like this are affecting their lives and their community, while enabling them to learn about social justice by defining and sharing their own solutions. DIYdoc’s is a technology company made up of app and media Producers with a mission to enable young people to use inexpensive smartphones, that are widely available, to understand filmmaking better and create high quality films that matter. Their templated filmmaking methodology helps young people to utilize the narrative structures that filmmakers use while focusing on the stories they want to tell, not the tools needed to tell the stories. 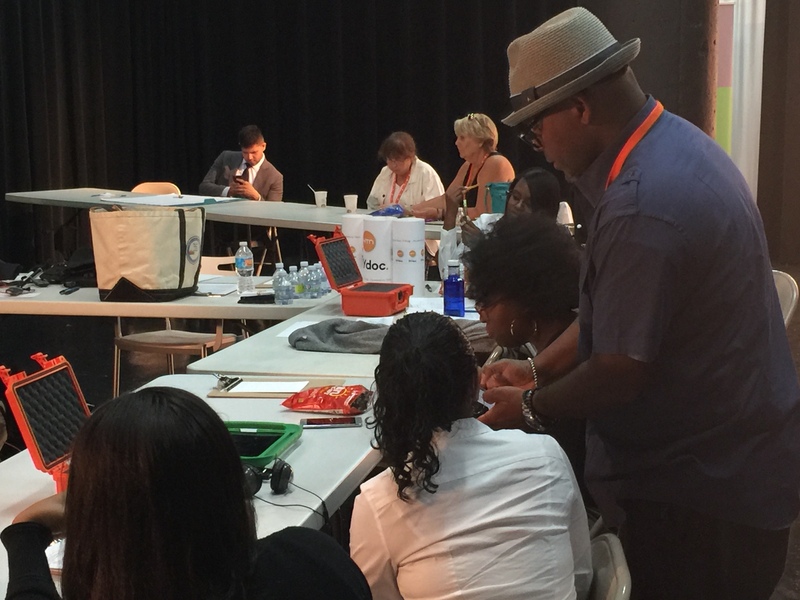 David Grandison Jr. a video Producer, and co-founder of DIYdoc, taught a pilot workshop for the program, at the HITN studios in early August 2017. The program was a three day seminar on digital storytelling and filmmaking. He used a project-based approach to help a group of almost 20 HITN interns learn the processes and strategies that filmmakers and advertisers use to tell effective stories that motivate audiences to act. The program enabled the young people to learn about the issues surrounding cyberbullying by creating PSA’s and News Stories to help the DA share information in ways that resonate most with Brooklyn teens. The teens worked in small production teams that learned the process of script writing, storyboarding, and finally shooting their stories in and around the Brooklyn Navy yards where HITN is based. The project-based curriculum that David has created groups students into small production teams consisting of a “producer”, a “writer” and a “videographer”, to simulate real-world video production and provide exposure to the production process film makers use. The interns shot their videos with iPod touch devices equipped with the free DIYdoc app. Teams were allowed to use teleprompter apps on iPads which are a part of digital filmmaking kits provided by HITN as well. The DIYdoc app based strategy, facilitated the process of teaching video production by allowing the students to focus on the storytelling and not learning to use the expensive tools many filmmakers use. This cooperative approach enables students to learn to use inexpensive mobile technology to tell powerful well thought out stories. David and John Carlin (Co-Founder of DIYdoc and Founder of RedHot.org) are working closely with Dr. Ed Greene and Julia Mair of HITN, Bobbi Brown and Ed Pichardo Esq, the Chief of Youth Diversion Programs at Kings County District Attorneys Office to create opportunities for Brooklyn youth to solve real world problems that can lead to incarceration. This partnership is enabling Brooklyn youth to help their community while learning about social justice via a real world video challenges, where their voices can be heard by a local and global audience. We ultimately are teaching them to become community advocates and “change makers” at a time when many youth feel their voices and choices don’t matter. Our pilot with HITN interns is just the start and it will enable us to improve both the app and the program. The youth ultimately provided a great deal of positive feedback on the approach and offered many ideas to improve the pilot program prior to its launch in Brooklyn Schools in the fall. Here is an example of a PSA that was created in the program. HITN, America’s only Spanish-language, nonprofit, public-service media network, works to advance the educational, cultural and socio-economic aspirations of U.S. Latinos through quality, authentic programming on-air, online and on the ground in communities. The cycle of cyberbullying is especially devastating to Hispanic teens, 32% of whom report going online “almost constantly.” (Pew) HITN is changing the game by becoming the first DIYdoc partner that is considering broadcasting our videos to a national audience. This should be a huge motivator to youth to create great films. 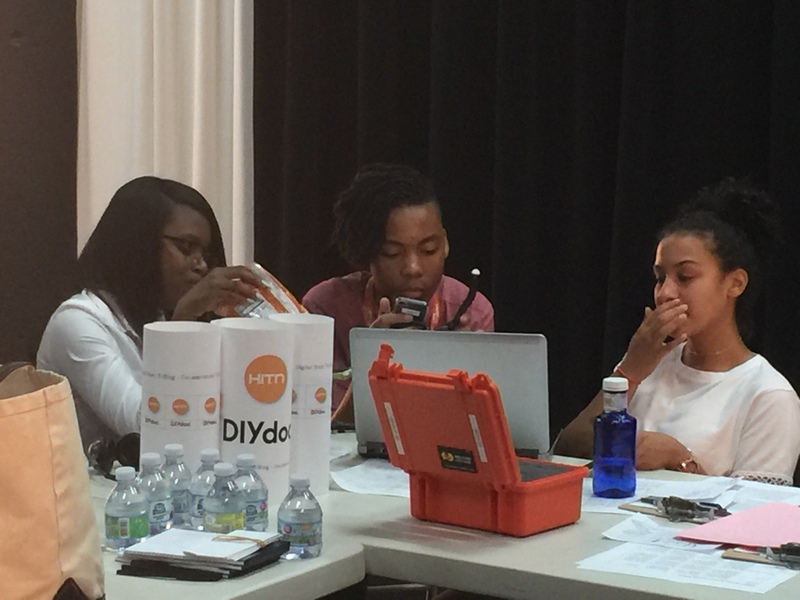 DIYdoc is launching a cutting edge digital storytelling project to enable youth in Brooklyn to learn about important issues like cyberbullying by creating news stories and PSAs on the issue itself. Cyberbulling, Cyber banging, sexting, and other troubling online trends are adversely affecting at-risk youth in marginalized communities in Brooklyn. The Kings County District Attorney’s Office Bureau of Youth Initiatives is tackling this challenge in a visionary way by creating ways to enable young people in the community to share their solutions to this challenge. DIYdoc is providing youth with a simple app based platform to share stories on how issues like this are affecting their community, while enabling them to learn about social justice by defining and sharing their own solutions. This project has been created through a collaboration between Hispanic Information and Telecommunications Network, Inc (HITN) and, the Kings County District Attorney’s Office Bureau of Youth Initiatives. The program is innovative because it will ultimately crowdsource the creation of short films created by youth, to help other youth to learn about cyberbullying, media literacy and social justice. This research-based educational method, created by David Grandison Jr (co-founder of DIYdoc), combines project-based learning and peer-tutoring to reach the DA’s goal of educating at-risk youth on this challenging topic. Research shows that youth are more likely to watch and share videos that are authentic and resonate as “real” to other youth, and we are hoping this technique will help at-risk youth in Brooklyn. The community will benefit since the app will enable them to share informative films on the topic as well as other local news stories with their friends and relatives. DIYdoc’s mission is to enable young people to use inexpensive smartphones, that are widely available, to understand filmmaking better and create high quality films that matter. Our templated filmmaking methodology helps them to utilize narrative structures that filmmakers use while focusing on the stories they want to tell, and not the tools needed to tell the stories. HITN is changing the game by becoming the first DIydoc partner to commit to broadcast our videos to a global audience. This should be a huge motivator to youth to create films. We are launching this digital storytelling pilot project in several Brooklyn public schools in June, 2017, under the auspices of the DA’s Bureau of Youth Initiatives. The project will be implemented through a series of workshops where experts from the DIYdoc team, HITN and the DA’s office, will train teachers and students to engage with other students to work together and create numerous short films. This program will ultimately create a platform for positive, responsible engagement between local youth and the prosecutor’s office, as well as, providing an exposure opportunity to students interested in a career in public service, law, app development, and multimedia production. This transmedia program and curriculum will enable these institutions to help minority youth by facilitating the sharing of stories on issues of critical importance to them. This transmedia program will enable the network HITN to enhance its presence in marginalized communities across the country by enabling young people to share stories and community news that is of importance to them. This program is a new approach news gathering, enabling the network to highlight the best stories and combine multiple stories into longer form news programming for broadcast. It is ultimately a new approach that will amplify the voices of urban youth at a time when they feel like they are a voiceless minority in America. Established in 1981 the HITN, headquartered in the Brooklyn Navy Yard, is America’s Spanish-language, non-profit, public service network. HITN strives to advance the educational and socioeconomic aspirations of U.S. Hispanics by connecting families, educators and community-based organizations to provide high-quality, educational resources via their national television network, community outreach and educational app-based technology products. We are excited to announce that the DIYdoc app is now available in the iOS app store. 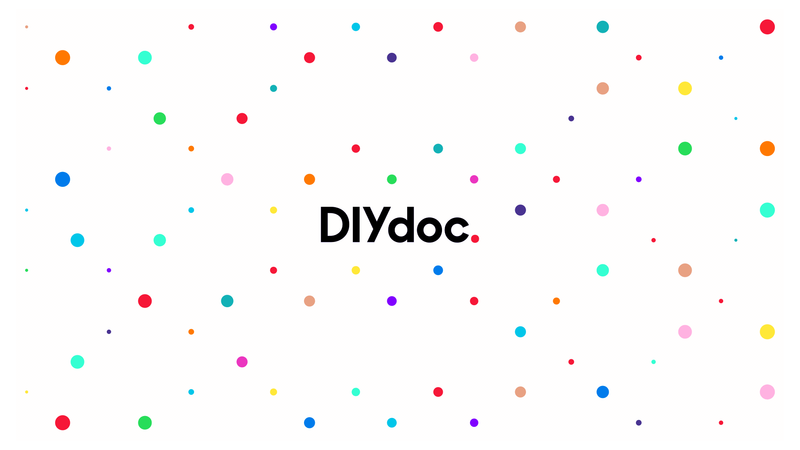 For almost a year, we have been working to develop and launch a crowdsourced filmmaking app called DIYdoc. The mission of the app is to enable companies and organizations to tell high quality, branded, user generated stories about their causes or initiatives. The power of cameras in smartphones is increasing exponentially with every new model, and we feel the applications of this cloud-based tech for user-generated testimonials, product reviews, or even how-to videos are numerous. Our app ultimately, enables large numbers of people to tell high quality stories and deliver powerful messages with their smartphones at a cost less than that of a single commercial. David Grandison Jr. conceptualized the project with John Carlin of Red+Hot Org. He led instructional design, IA, and product management (in conjunction with Paper and Equator for UX, design and development). The app works by providing a template that scaffolds a user through the most important steps needed to create the scenes in a short film. We help users understand and execute the most important steps in filmmaking, like shooting an establishing shot, framing shots and interviewing. We ultimately enable anyone with a smartphone to create compelling scenes that are part of an organized story arc. 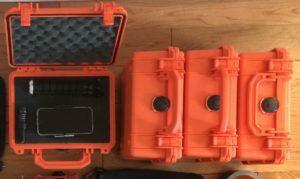 Once the user finishes shooting their scenes, their film is then uploaded edited in the cloud where logos graphics and other transitions are added automatically, and then, within minutes a completed film is returned to the user in the app and via email, where it can be shared via social media. Our app evolves user generated video creation from impromptu rants on Facebook Live, Snapchat, Instagram or Periscope, to a time when users are able to provide brands and organizations with well thought out, authentic stories that reach the goals of the sponsor organization or brand. This tool ultimately facilitates the creation of compelling user-generated stories. The app can be replicated as a white labeled tool and deployed for any organization whose team members or constituents have important stories to tell. We have currently created and launched 2 versions of the app. One for Advocates for Youth and their “1 in 3” campaign which was designed to help their team’s activists create videos that educate users on reproductive rights. And another version has been created for Alicia Key’s We Are Here Movement. We designed this version to empower refugees, activists, and people living with HIV to tell their stories. Our partners at Alicia Key’s We Are Here Movement; Keep A Child Alive Foundation and Red+Hot Organization, are helping us to develop this new technology to enable activists at their partner clinics, and victims of the global refugee crisis, to make high quality, branded films using inexpensive smartphone-based tech. Our launch comes after many months of Beta testing abroad, helping these organizations to provide lifesaving messages. All of our templates are created by professional Directors or Producers like myself. The We Are Here version of the app, features a template by Jonathan Olinger, a filmmaker who directed Let Me In, a music video/short film that draws attention to the struggles of refugees, with the help of the music and lyrics of Alicia Key’s. Jonathan’s template, “I am a Refugee”, is user generated transmedia component of this video. It is enabling the voices of refugees to be documented and captured by the organization for use in their promotional media. We created another template called, “I Am So Much More than HIV” for another WE Are Here Movement partner organization called, Keep A Child Alive, to help spread the important lifesaving message of how to live successfully with HIV. We coupled these templates with several other templates, “I Am An Activist” that enables activists to tell their stories. And finally, we created a template called “Silly Selfie” to enable kids in orphanages sponsored by Alicia Keys, to have fun with an app and tell their own more visual stories. David traveled to Kampala, Uganda with several leaders from Keep a Child Alive in August (2016), to train, and deploy, and Beta test the app in one of the most technologically challenged and underserved parts of the world. Our activist and beta testers were flown in from Rwanda, Durban, Kigali and several other cities in India, by our sponsors Keep A Child Alive and Red+Hot Org. Our team gave activists and organization leaders (pictured above) iPod Touch devices loaded with the app and offered them a week long project-based Digital Storytelling Workshop. The goal for this deployment was to train-the-trainer and enable activists, many of whom are successfully living with the HIV virus, to use our app to document the powerful stories of other activists, and HIV survivors who visit their clinics regularly for free medication. We hoped to help them document what is working and changing lives at their clinics, so that it can be shared via social media to empower others and spread the word about their cause. We successfully deployed the private beta of our app for activists to use and make films to tell their own stories to a global audience. Since the Beta launch hundreds of films have been made to spread important lifesaving messages in the developing world. In Sub Saharan, Africa and India, AIDS is still taking millions of lives due to stigmas around HIV testing and seeking treatment. Many people in these underserved regions, still think HIV is a death sentence, when it has actually been relegated to a chronic illness by medical advances in more developed parts of the world. Simply visiting a clinic in many parts of Africa and India can cause those seeking help or life saving medication to become victims of discrimination and sometimes violence. DIYdoc is helping to break the stigmas around HIV using inexpensive, smartphone-based storytelling. We hope to democratize filmmaking and challenge activists living with HIV to make and share films about those who are successfully living with HIV in their communities. I Am So Much More Than HIV – The film features Vivian, a youth leader/activist living with HIV. She helps and counsels teens providing strategies for living with the virus in a club called the “Victors Club” at Alive Medical Services in Kampala Uganda. I Am So Much More Than HIV– Our filmmaker, Chi Chi from Durban South Africa experiments with different filmmaking effects to highlight the positive outlook of a HIV survivor from her clinic. I Am An Activist – This film features Edwin, from the Youth Zone, in Kenya telling about his organization’s programs. The Filmmaker was Brad from Bobbi Bear. I Am An Activist – This film features Brad, from Bobbi Bear, organization that helps young victims of sexual abuse in Durban, South Africa. As a part of Alicia Key’s We Are Here Movement we are trying to reboot the world, with social innovation and we want to thank her for her visionary leadership and funding. Here are a few of the other partner organizations that we owe special thanks; Red+Hot Organization, Fame Currency, Keep A Child Alive, Care, Bobby Bear, War Child and OxFam. Please DOWNLOAD DIYDOCfrom the iOS app store, give it a try and share a review…We would love your feedback! When shooting a scene in which you, or the subject wants to appear as anonymous source it is important to allow for privacy while preserving their credibility as a source. These techniques can be used in a variety of ways to create beautiful and interesting scene effects that meet both of these goals. Backlighting the Subject- This is the simplest method to obscure a users face and and preserve their privacy. This can be done in a variety of ways, from shooting the user in front of a window in bright daylight and using causing the automatic shutter on your smartphone or camera to close darkening the subject and lighting the window. When shooting indoors the filmmaker can use bright lights placed directly behind the user to create this effect. Screening the subject- Placing a transparent screen or sheet between the camera and the subject while using a backlight. This technique is a bit more complex as the filmmaker must experiment more with lighting to compensate for screen density (opacity). A variety of artistic effects can be created by playing with stretched vs. draped sheets, screens, veils or backdrops when using this technique. Be sure to have a frame to hang your props from and be sure to have plenty of clothes pins or clamps to hold your screen. And strong enough lighting to create a highly defined silhouette or shadow that still can elicit emotion from your viewer. Best results will come with white or neutral colored screens but be sure to experiment with the kinds of interesting and beautiful effects can be created with different materials and different angles of the subject against them. Shooting the Subject’s Shadow – This is the reverse of “Screening the Subject” instead of shooting the subject through a screen you are shooting the subjects shadow in front of a neutral screen or light, neutral colored wall. Shooting a Subject from Behind- this method can be challenging because the subject is shot from what is called the “reverse angle”. Shooting Close-ups of the Subject’s Body and hands- this is accomplished by shooting tight close-up of hands, feet and ideally alternating between them and the obscured shot of the subject. Shooting medium shots of a partial profile (not showing the face but the profile), showing shoulders (a modified “Over-the-shoulder” shot), arms and hands from behind. The method preserves powerful emotion that can be elicited from hand gestures. Use a POV Shot- shooting recreations of an event, while walking with the smartphone camera in front of you at face level and turning as the head turns to explore a important location, can have a powerful effect on the user. It is so interesting to experiment with having the subject try to create this shot while describing an event or emotional incident to illicit more vivid memories about places or event that are being described for the viewer. Obscuring the face with digital tools or virtual objects- a variety of app tools or camera settings exist to allow a filmmaker to use digital tools to obscure a user’s face. There are camera effects like pixelization, racking the focus (playing with the focus), adjusting the aperture (when using cameras), to applying virtual digital objects that track the face as the head moves like masks, mustaches, wigs or even a black bar over part of the face (as used in “censored” videos) can be used. 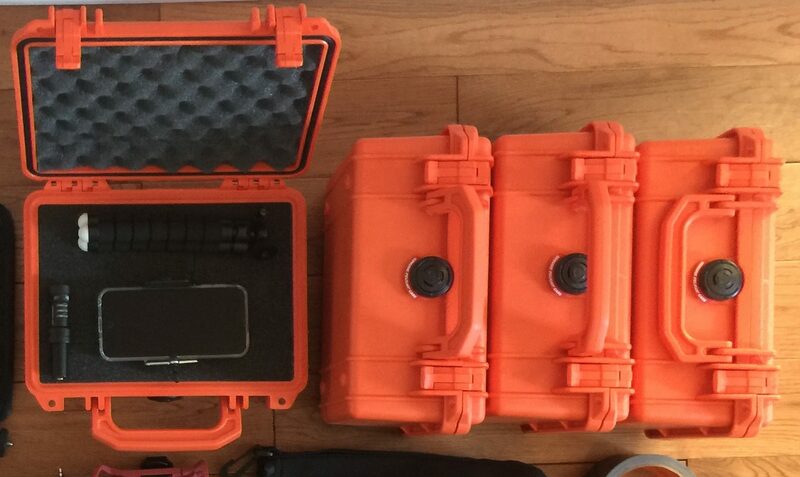 Here are a few tool options to increase the quality and the production value of your scenes. Shooting video with a smartphone is easy. Shooting excellent video that look professional is tough. Here is a “How To” article with a few tips to help you shoot video like the pros no matter what camera you are filming with. A scene or shot should be imagined as divided into nine equal parts by two equally spa​ced horizontal lines and two equally spaced vertical lines.and that important compositional elements should be placed along these lines or their intersections. Aligning a subject with these points creates more tension, energy and interest in the composition than simply centering the subject. For a low tracking shot try using a wheelchair or skateboard as a cheap set of wheels. Take your time and hold your smartphone with both hands, and keep your elbows against (or close to your body) so you can keep your camera steady. It’s super tough to edit shaky footage. The iPhone refocuses when you tap the screen. Tapping on the screen over the subject once before you start shooting will focus the shot on the key subject in your image (it also tweaks exposure and color balance). A tap on the screen determines both the exposure and color balance (as well as focus) for your scene. If the shot is too dark, light, or it is dull colored try tapping and see if the image improves. Shooting with a smartphone while holding the handset vertically will mess up your film with ugly black bars on each side of the screen. Hold your phone horizontallyto fill the frame with a beautiful 16:9 HD footage. Never shoot video the way you use a phone when making calls or launching apps. When shooting with a smartphone pan by keeping the camera horizontal and rotating your wrist, at the waist or spin slowly in place with your feet. Tripods are great, but if you rotate slow and steady, your body can give you a pretty smooth pan. Always remember to turn on lights before you shoot to avoid grainy dark footage. Take the time to find a bright location and if outdoors stand between your subject and the sun. High quality video is well lit, but avoid using the LED light on your phone it can make your subjects eyes look creepy. It’s all about your framing, try to shoot your subjects at eye level rather than shooting down on them. Unless you’re making a monster movie, avoid shooting your subject from a low angle. That said, try to shoot female subjects from slightly above their eyeline rather than straight on, some pros feel it enhances their beauty. The press of the button usually causes a shake at the start and stop of shooting. Remember, when you press the button to start filming and when you hit it again to stop, not to shake camera. Bracing your your elbows against your body can help stabilize your shot and protect against this issue. DIYdoc is an app that enables crowd-sourced social storytelling with a level of quality and scale that has never been possible before. Social documentaries have been a force for social change and enlightenment for over 100 years by giving us true stories about what’s really going on in the world. Until now those documentaries have mostly been the work of filmmakers and citizen journalists. The combination of digital technology, social media and smartphones finally puts the tools for making documentaries in everybody’s hands. But it’s harder to tell a story than it seems. So we created this app to help people collaborate with expert filmmakers, writers, artists and creative directors to tell stories that matter.